X Pumpt sich eines der zwei Smogon auf, lässt das andere Luft ab. So findet ein Giftgasaustausch statt. X Si l’un des deux Smogo se gonfle, l’autre se dégonfle. Ils mélangent leurs gaz en permanence. X Si uno de los gemelos Koffing se infla, el otro se desinfla. Mezclan constantemente sus venenosos gases. X Se un gemello Koffing si sgonfia, l’altro si gonfia. I gas velenosi dei due si mischiano continuamente. X 한쪽이 부풀어 오르면 다른 한쪽은 오그라드는 쌍둥이 또가스. 항상 체내의 독가스를 섞고 있다. Y Sehr selten führt eine plötzliche Mutation eines Zwillings-Smogon zu einer Verbindung zu Smogmog. Y Il peut arriver que deux Smogo mutent et s’associent pour former un Smogogo, mais c’est très rare. Y En raras ocasiones, se produce una mutación y dos pequeños Koffing se unen formando un Weezing. 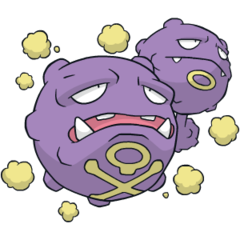 Y Una rarissima mutazione può trasformare due Koffing gemelli in un Weezing. Y 극히 드물게 돌연변이로 쌍둥이인 작은 또가스가 연결된 채로 나오는 때가 있다. Omega Ruby Weezing alternately shrinks and inflates its twin bodies to mix together toxic gases inside. The more the gases are mixed, the more powerful the toxins become. The Pokémon also becomes more putrid. Omega Ruby Smogmog bläst seine beiden Körper abwechselnd auf und lässt sie wieder zusammenschrumpfen, um die giftigen Gase darin zu vermischen. Je mehr Gase vermischt werden, desto stärker werden die Toxine. Omega Ruby Smogogo rétrécit ou gonfle ses deux corps pour mélanger les gaz toxiques qui s’y trouvent. Lorsque les gaz sont bien mélangés, la toxine devient très puissante. Le Pokémon se putréfie aussi un peu plus. Omega Ruby Weezing reduce y agranda el doble cuerpo que tiene para mezclar los gases tóxicos que contiene. Cuantos más gases mezcle, mayor será la toxicidad y el nivel de putrefacción del Pokémon. Omega Ruby Weezing gonfia e sgonfia ritmicamente il suo duplice corpo per miscelare i gas tossici all’interno. Più a lungo vengono mescolati i gas, più nocive diventano le tossine. Anche il Pokémon diventa ancora più putrido. Omega Ruby 똑같이 생긴 몸을 교대로 오그라트리고 부풀리면서 독가스를 섞고 있다. 섞을수록 독소가 강해져 악취가 난다. Alpha Sapphire Weezing loves the gases given off by rotted kitchen garbage. This Pokémon will find a dirty, unkempt house and make it its home. At night, when the people in the house are asleep, it will go through the trash. Alpha Sapphire Smogmog liebt die Gase verrottender, fauler Küchenabfälle. Dieses Pokémon sucht sich ein vernachlässigtes, schmutziges Gebäude und richtet sich dort häuslich ein. Nachts, wenn die Menschen schlafen, wühlt es im Müll. Alpha Sapphire Smogogo adore les gaz qui se dégagent des aliments pourris dans les poubelles. Ce Pokémon cherche généralement les maisons sales et mal tenues pour y habiter. La nuit, quand tout le monde est endormi, il fouille les détritus. Alpha Sapphire A Weezing le encantan los gases que emanan de los desperdicios que quedan en la cocina. Este Pokémon busca casas sucias y descuidadas para crear su hogar. De noche, cuando los habitantes de la casa duermen, va a por la basura. Alpha Sapphire Weezing adora i gas emanati dai resti alimentari in decomposizione. Si sente a suo agio in case sudicie e maltenute. La notte, mentre dormono tutti, lui si aggira furtivo tra i rifiuti domestici. Alpha Sapphire 부패한 음식물 쓰레기에서 나온 가스를 매우 좋아한다. 청소하지 않는 집에서 눌러살며 가족이 모두 잠든 한밤중에 쓰레기통을 뒤진다. Red Where two of poison gases meet, 2 Koffings can fuse into a Weezing over many years. Blue Where two of poison gases meet, 2 Koffings can fuse into a Weezing over many years. Yellow It lives and grows by absorbing dust, germs and poison gases that are contained in toxic waste and garbage. Stadium A twinned Koffing that forms on rare occasions where poisonous gases pool. Its two toxic gases appear to be different. Gold If one of the twin Koffing inflates, the other one deflates. It constantly mixes its poisonous gases. Silver Top-grade perfume is made using its internal poison gases by diluting them to the highest level. Stadium2 If one of the twin Koffing inflates, the other one deflates. It constantly mixes its poisonous gases. Ruby Weezing loves the gases given off by rotted kitchen garbage. This Pokemon will find a dirty, unkempt house and make it its home. At night, when the people in the house are asleep, it will go through the trash. Sapphire WEEZING alternately shrinks and inflates its twin bodies to mix together toxic gases inside. The more the gases are mixed, the more powerful the toxins become. The POKeMON also becomes more putrid. Emerald By diluting its toxic gases with a special process, the highest grade of perfume can be extracted. 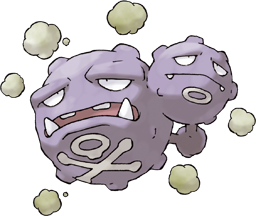 To WEEZING, gases emanating from garbage are the ultimate feast. Pearl It grows by feeding on gases released by garbage. Though very rare, triplets have been found. Platinum It grows by feeding on gases released by garbage. Though very rare, triplets have been found. Black It grows by feeding on gases released by garbage. Though very rare, triplets have been found. White It grows by feeding on gases released by garbage. Though very rare, triplets have been found. White 2 Inhaling toxic fumes from trash and mixing them inside its body lets it spread an even fouler stench.